Welcome to Room 17 and the 3rd grade fun! I am beyond thrilled to be back again for my second year here at AVCS. 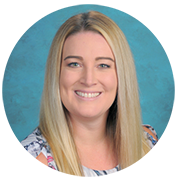 My name is Mrs. Kelly Gomez and I am incredibly blessed that the Lord chose me to be a part of the AVCS staff, families, and students here. Last year I taught 4th grade and had a fabulous year, but I am excited to begin a new grade level now and meet all of you! I was born and raised in California and attended Liberty Christian School in Huntington Beach before attending college at California State University of Fullerton. I earned my B.A. in Communicative Disorders for Speech Therapy, but ultimately knew my place was to be in a classroom. I earned my teaching credential from California State University of Fullerton and worked in Irvine Unified School District for 3 years before going back to California State University of Fullerton to earn my M.A. in Education. I have taught 1st, 3rd, and 4th grade in Irvine Unified School District and taught 4th grade at Red Hill Lutheran School in Tustin. I have a tremendous passion for teaching children and place a high standard on education. I believe that all children can learn when given the right tools and a dedicated teacher. I believe a classroom is a place where all children need to have equal opportunities to show their individual strengths and build and connect upon their unique differences. I believe that education and learning should be fun, exciting, challenging, and rewarding. I view education as a partnership between the home, the school, and the community. I live in Irvine with my husband, David and my three year old daughter, Gabriella. David and I have been married for 7 years and love to spend time together as a family. I am extremely excited to be back again as part of the AVCS family and I look forward to a fun school year full of learning!